Son of Percy James Lawrence and Nellie Emily Lawrence nee Hefford. Husband of Dorothy Violet Lawrence nee Clark, of Banstead, Surrey. Stanley known as Sammy, and his wife Dorothy who lived in Fulham with her parents, were married in Fulham in 1935. They rented a flat in Ealing and their daughter Monica was born in April 1938. Four months later the family all moved to 'Ambrosia', Holly Hill Drive in Banstead. Stanley, being by then a Chartered Surveyor with I.C.I. had a good job and was able to afford the mortgage to buy a lovely house which cost the princely sum of £1,285. The family even had a phone and Stanley P Lawrence is listed in the phone book issued for 1938-1943 at the Banstead address. 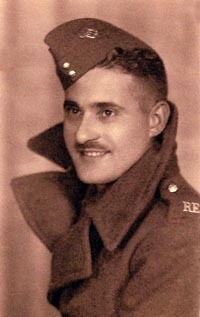 Stanley enlisted into the Royal Engineers with the Territorial army in September 1940. Within a few months he was posted to 'D' and later 'C' Companies. In May 1941, he was discharged, having been appointed to a Commission as Second Lieutenant, the General list. He was immediately appointed Brigade compensation Officer HQ 1st Corps and by mid May he was posted to the 9th Surrey Regiment Royal Artillery. In September 1939, the situation with regard to the supply of officers was different from that which had existed in 1914, mainly in respect of the administrative machinery and nuclei which now existed for necessary expansion of a wartime officers corps. Moreover, it was decided that no new permanent commissions would be given after the declaration of war or the outbreak of hostilities, except to persons who had already qualified (by August 1939) for such commissions(through cadet colleges etc). All commissions would therefore be "Emergency Commissions in the Land Forces for the duration of the war". After the fall of France in 1940, there was a need for a great number of new officers, not unlike the situation which arose in 1914-15. However, all these emergency commissioned officers were not on the still extant General List. It appears that this continued to be used as a home for those men who were commissioned for special duties - for one reason or another these men were not suitable, or qualified for commissions in , say, the combatant arms, or their employment was not appropriate for an ordinary commission - as in the First World War. 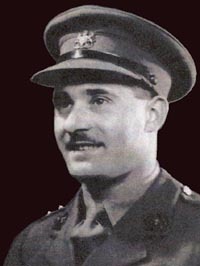 Stanley Lawrence's profession as a Charted Surveyor and his service with the Royal Engineers presumably gave him the skills which the Army decided could be more usefully employed in the UK and hence his inclusion in the General List as commissioned for special duties. In 1942 he was based in Yorkshire. His Battalion would have been spread far and wide, in and around Hull and East Yorks, on various types of ack-ack gun sites .. Such battalions would be attached to Royal Artillery units to man the actual guns, and the Royal Engineers would have been involved more with erecting, maintaining and operating searchlights that went with the gun batteries. Stanley would have been in charge of a few companies of men, each manning a particular site or group of sites. Lieutenant S P Lawrence was stationed at Beverley, a small and pretty market town, about 8 miles north of Hull. During this period Hull was subjected to numerous air raids by the Germans who frequently droped their unused bombs over the area prior to heading back to base. The town of Beverley had been largely untouched by bombing raids. On the bank holiday of 3rd August 1942, Stanley Lawrence was off duty and went out for a bike ride cycling through Flemingate which is on the main road approach into the town, just a few hundred yards short of the Minster. A single German plane flew over and dropped four 500kg high explosive bombs on the Flemingate area of the town. The first bomb damaged a local Tannery while the second exploded in Flemingate destroying 4 Brentwood Villas. This bomb killed one of the occupants, Mrs Francis Snowden, and badly injured Lieutenant Stanley Lawrence who was cycling past at the time of the explosion. Bomb number three detonated behind Flemingate Methodist Chapel wrecking a medical rest centre and damaging several cottages in nearby Sparkmill Terrace. The explosion also killed Mr Charles Cross, an off-duty air raid warden, who was outside feeding his rabbits at the time. The fourth bomb failed to detonate. Lieutenant Lawrence and about fifteen other casualties were quickly ferried to the Beverley Base Hospital. 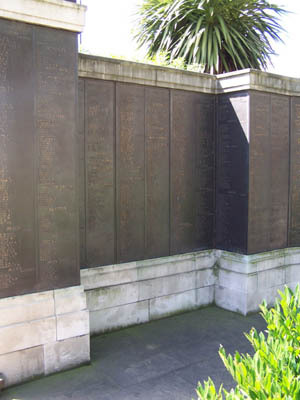 The number of casualties could have been much higher but on that day, the latest 'Old Mother Riley' film was showing at the Marble Arch Cinema on Butcher Row and many Flemingate residents had gone to see it. 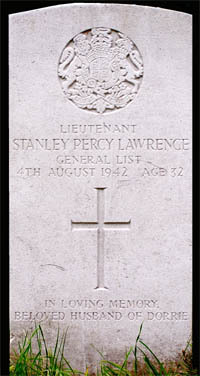 Stanley Lawrence died from his injuries on the following day, the 4th of August 1942. He was just 32 years of age and the cause of death was attributed to 'War Operations'. He is buried in Kensal Green Cemetery (Grave Reference: Square 9. Row 7. Grave 47656) in West London which is a private cemetery where families could buy plots for interment. All his family were born and raised in Kensington (or more properly, Notting Hill) and Kensal Green Cemetery seemed the obvious place to lay him to rest. All his family are together in the same grave which also has a Commonwealth War Graves Commission headstone. Mrs Lawrence remarried in 1945 and with her husband and daughter continued to live in 'Ambrosia'. In 1947 they had another daughter and in 1950 the family moved to another property in Banstead, this time in Colcokes Road. Mrs Lawrence and her husband moved to Cornwall in 1960 after Stanley's daughter Monica was married at All Saints Church during the previous year. Thus ended the family's time in Banstead. "I have very fond memories of 'Ambrosia'. After my father died my mother filled the house with people and there was a lot of laughter in spite of it being such a tragic time for her. "I wish I'd known my real father. I have no memory of him at all, just images smiling at me out of black and white photographs. My mother was a war widow and very early on in her bereavement she took me on her knee and showed me his soldiering things – a cane which I still have, and some service medals which she subsequently threw away. 'They were only bits of tin, what did I want with those?' she said bitterly years later. Another souvenir was a camp bed on which I slept, during the latter half of the war, in the cellar underneath our kitchen. During my school days I used his boxed geometry set, a tool of his trade as a chartered surveyor. Not that it helped me like the subject any better, but I somehow felt proud to be using something that his hands had touched. When my mother died, among her things were other treasures - a letter written to her by my father when she was pregnant, sepia photos of him as a baby which I stuck in an album, in some way trying not to lose anything that enabled me to feel a link with him. What sort of a father would he have been, I wonder? Would we have had a good relationship? How would he have coped with my truculent teenage years? Would he have been a good mentor? And even - what sort of grandfather would he have been? To me, he will always remain some sort of paragon since I was never able to question anyone about what he had really been like. By the time I was old enough to wonder about these things, my mother had married again and my step father never referred to my mother's previous life. In some ways I feel robbed of not knowing my father and his family. They all died within four years of each other, thus wiping out almost everything my mother had held dear. No wonder she and I always remained close. I was all she had left of those halcyon days. For all my mother's personal tragedy in the war years, my memories of that time are not unhappy. Mainly, they consist of our house full of people and nights spent sleeping in the cellar under the kitchen and a huge spider that visited one evening, a train journey or two which I believe were to see my father when he was stationed in Yorkshire, and being evacuated to the farm cottage of some friends in Berkshire. It is there that I first encountered geese, barns full of hay, the smell of wood smoke, golden cornfields to play in and always the presence of my mother. I was too young to miss my father, and indeed for the better part of our short time together he had been away working for ICI or in the Forces, anyway. I'm sure he had his faults, but I like to think my father would have been a good man and done his best to bring up his strong-willed daughter with firmness, kindness and humour. But then, I suppose that's the ideal all daughters have of a father." Living in Holly Hill Drive, the Lawrences were neighbours with the Remané family who also tragically lost the head of the household, Serjeant Clifford Remané. Mrs Lawrence noted that Mrs. Remané did not talk about her husband much. She did however feel some affinity with her and she used to say that Mrs. Remané was the only other person she knew who had been widowed by war. Family history by Barbara Rough. Relatives traced by Christine Kent. Service record from Ministry of Defence letter dated 1988. Information on the General List from Ministry of Defence letter dated 30 March 1988. 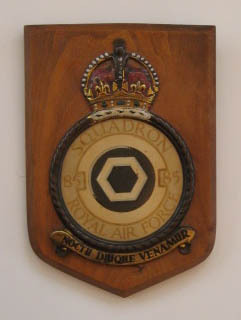 Royal Air Force Volunteer Reserve 85 Sqdn. 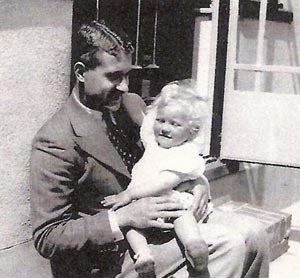 John Peter Marley Lintott, known as 'Peter' was born on the 22nd of June 1921, his birth being registered in Bromley where his mother's maiden name was recorded as Spence. The only son of Mrs and Mrs Percival Lintott, Peter spent most of his life at :'Romina' (No. 60) Woodmansterne Lane, Banstead, to where his parents moved when he was about 3-4 years old. Mrs Phyllis Lintott known in the family as Daisy and later by her grandaughter as "GrannyPhyl" always recalled how Peter's passion from a very young age was a love of planes. He photographed many aircraft and built his own model planes. He photographed the models as well and his collection of photographs remains with the family. One other interesting momento of Peter's retained by the family is a cricket ball he was presented with at Ewell Castle school in 1938. The inscription shows that he threw the ball seventy eight and one half yards to win the competition. John Peter Marley Lintott was a Volunteer Reservist when he joined the Royal Air Force but the wartime status of 'reservist' rather detracts from the fact that from an early age Peter had wanted to fly and had applied for a short service commission with the RAF before the war. 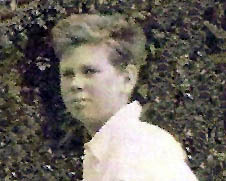 He'd applied and had been accepted in August 1939 shortly after leaving Ewell Castle School, where he'd been educated. The outbreak of war brought about the cancellation of the Short Service Commission scheme and his acceptance was automatically cancelled. Greatly disappointed, he immediately volunteered for the RAFVR. As a member of the RAFVR he was just that, 'a volunteer' and probably completed his aircrew training sometime after the Battle of Britain, probably in early 1941. His photo (shown top left) shows Peter immediately before aircrew training - the white flash in his forage cap meant 'selected for aircrew'. 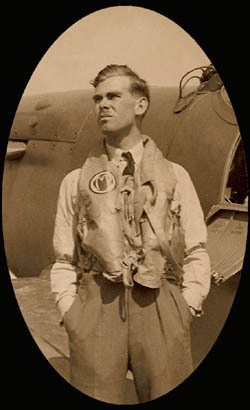 Posted to a Spitfire squadron, Peter served under the command of Wing Commander Douglas Bader, on the strength of 616 squadron. This was one of three which made up the Tangmere Wing in the summer of 1941. Douglas Bader was himself shot down in August of that year. 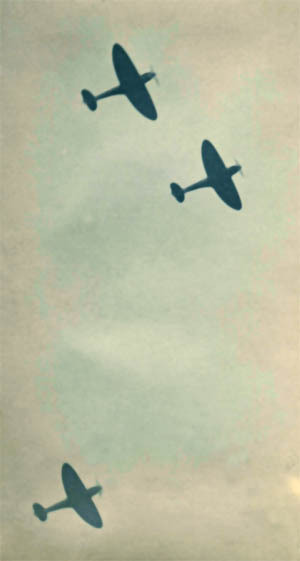 The photograph on the left shows Peter leading a flight of three Spitfires from RAF Heston. The two other Spits are being flown by pupil pilots. The photo was taken from the garden at 'Romina', 60 Woodmansterne Lane, Banstead, where Peter grew up. Peter was apparently shot up and wounded on a sweep over France but made a good landing upon return to base. He appears to have completed a tour of operations because he then completed a six-month tour as an instructor before moving onto experimental flying on American built B17 'Flying Fortresses'. 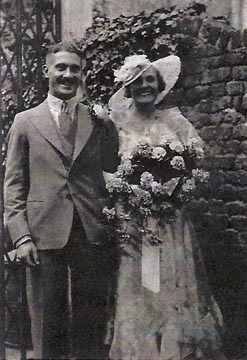 Peter and Shirley on their wedding day. 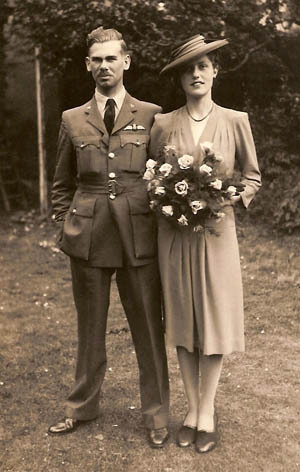 In June 1942 Peter married a girl from Croydon whom he had met two years earlier on the 13th April 1940, at a party. The party was to celebrate the 21st birthday of Ian Spence, Peter's cousin. Peter knew that Ian was friendly with the Parke sisters and specifically asked him to invite them to the party. Miss Shirley Winifred Parke, one of the sisters would eventually become Peter's wife. The marriage would never have kept Peter away from his beloved flying and clearly anxious to get back into the fight, he applied for a posting to 'nightfighters' and in late 1942 he arrived at RAF Hunsdon in Hertfordshire, a satellite airfield of RAF North Weald. He was by this time an experienced pilot with both combat and training tours behind him. Here he joined the strength of 85 Squadron flying deHavilland Mosquitoes, where he was crewed with Sergeant (later Pilot Officer) George Gilling-Lax as his Navigator/Radar Operator. George had been to school at Marlborough before gaining a first class degree at Cambridge. He was a House Master at Stowe school between 1937-39 when war broke out. After joining the RAF he trained as a navigator, although on night-fighting Mosquitoes his primary responsibility would be the operation of the AI (airborne interception) radar used to locate enemy night raiders. No 85 was one of the RAF's oldest and most distinguished squadrons with a history going back to the First World War. It was heavily committed in the Battle of France and in the Battle of Britain. During the latter, it was based at Croydon under the command of S/L Peter Townsend who also oversaw the squadron's conversion to a specialist night-fighting role in the winter of 1940/41. During the Luftwaffe's night offensive which continued sporadically throughout 1941 and 1942, the Squadron experimented with a number of innovations, including 'Turbinlite' Havocs, a twin-engined medium bomber with a searchlight mounted in the nose to illuminate German bombers and with an accompanying Hurricane to shoot them down. Under their commander, Wing Commander Gordon Raphael, 85 Squadron began to re-equip with Mosquitoes on August 15th 1942 but it would take until October 19th until 85 Sqn saw action with their new charges, Flt Lt Nigel Bunting damaging a Ju88 over East Anglia which limped away smoking. It was perhaps appropriate that 85's first Mosquito victory was claimed by Gordon Raphael and his navigator, Warrant Officer Nat Addison, who shot down a pathfinder Junkers 88 of I/KG66 on the night of January 14th 1943. 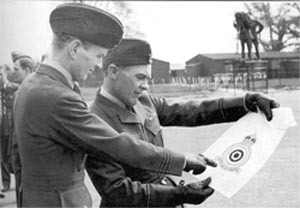 Wg Cmdr John Cunningham (left) admires the new official 85 Squadron crest at RAF Hunsdon on May 5th 1943. 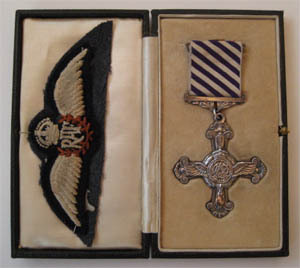 Flying Officer E.A. Robertson the Squadron's Intelligence Officer holds the crest. It was Robertson who countersigned Lintott's combat reports now held by the National Archives. Just days after this victory Raphael was given a deserved rest from operations and command of the squadron passed to Wing Commander John Cunningham DSO*, DFC*, who arrived with his navigator Jimmy Rawnsley from 604 Squadron. The Squadron was by now commanded by one of the most famous RAF night fighter pilots of the War, Wing Commander John Cunningham having been nick-named 'Cat's Eyes' by the press, on account of his prowess, having already shot down 10 enemy aircraft between November 1940 and May 1942. He would destroy several more aircraft whilst on Mosquitoes and ended the war with 20 Confirmed victories, 3 Probables and 7 Damaged. 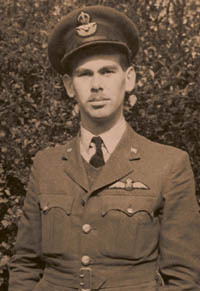 John Lintott was clearly an experienced pilot at this time and held the rank of Flight Lieutenant. John Cunningham was an extremely demanding commander and when he arrived at 85 Squadron he quickly assessed the abilities of the aircrews. 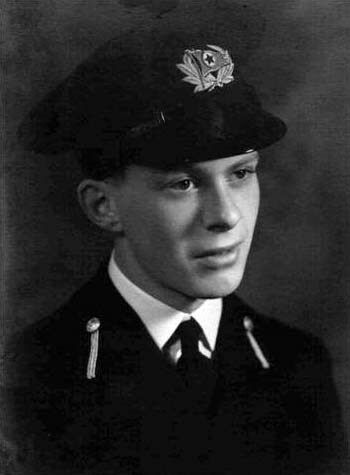 Some were posted out of the squadron and several others were brought in.It is possible that John Lintott and his radar operator P/O GG Gilling-Lax were brought into the squadron by Cunningham because of their previous experience and paired as a new crew on the squadron. Under Cunningham's command, 85 Squadron were to become a formidable night fighter squadron and in March they were selected to introduce the high altitude Mosquito NFXV's into service, Flt Lt Nigel Bunting getting one up to 46,000 ft on April 10th. With the threat of high altitude raids diminishing these aircraft were withdrawn from service. In the same month they also exchanged their Mosquito NFII's for the more advanced NFXII's. These aircraft (of which only 97 were built) had the more powerful Merlin 21 or 23 engines and a more advanced 'AI' capability. The new Mk VIII radar which operated on a 10cm wavelength, required a parabolic reflector to be housed in the nose of the aircraft, giving the Mosquitoes a distinctive 'thimble nose', making external aerials unnecessary. The squadron had not seen much action at the end of 1942 but in the spring and summer of 1943 the Luftwaffe embarked on a renewed night offensive combining the latest generation of it's twin-engined Junkers 88's and 188's and Dornier 217's, the less effective Heinkel 111's now effectively obsolete. At 23.10hrs on the evening of April 24th 1943, John Lintott and George Gilling-Lax took off from Hunsdon to patrol Foulness, before being redirected to North Weald Control. They were then passed over to a Ground Controller (G.C.I), Sqn Ldr Bickerstaff at East Hill, who vectored the Mosquito crew onto a 'bandit'. The enemy aircraft was closed on from a distance of 14 miles and Lintott and Gilling-Lax eventually spotted the exhaust flames of the enemy bomber. Closing in still further, they made out the silhouette of a Junkers Ju88, barely weaving above an 8/10ths cloud layer. John Lintott checked once again by flying above and behind the Ju88, before dropping below it, pulling the nose of the Mosquito up and opening fire. His 20mm cannon fire ripped into the fuselage of the Junkers which immediately caught fire. Lintott fired again and the Junkers' starboard engine flashed as it too was hit. The Junkers turned over onto its back and dived vertically into the cloud. The time was 00.25hrs. The G.C.I advised Lintott not to follow due to the poor visibility lower down, but the advice became academic as the crew saw a bright red glow in the cloud, as if the Junkers had exploded. Lintott and Gilling-Lax resumed their patrol over Foulness until 02.00hrs after which they returned to Hunsdon landing at 02.20hrs. Lintott & Gilling Lax's first confirmed victory was a Junkers 88A-14 (Wrk Nmr 144372) of 8 Staffel KG6, coded 3E+HS. Piloted by Lt A. Beyerle who was killed, together with Fw. J. Schund and Fw. G. Schuster. Uffz. E. Behmer baled out and was captured. The aircraft broke up over Bromley in Kent and wreckage was scattered over a wide area. The largest chunks of wreckage landed on Nos 124-126 Widmore Road, Bromley destroying the two large houses. These have since been replaced by a block of flats called Cromarty Court. A new danger now threatened UK airspace in the form of large numbers of single engined Fw (Focke Wulf) 190 fighter bombers who flew intruder missions into UK airspace. A new Schnell Kampfgeschwader, 'Fast' Bomber Group, SKG10 were directed to commence operations against the UK. It was specifically to address this last threat that after two years at RAF Hunsdon, the squadron were advised on May 5th 1943 (coincidentally the same day that the Squadron was officially presented with its new crest) that they were to move to RAF West Malling in Kent within the Biggin Hill sector, although there remained the question of just how capable the twin-engined Mosquitoes would be against the heavily armed and nimble German single seat fighters. Any concerns that the Squadron might have had in this respect were lost in a display of youthful exuberance for on May 13th, the day that the Squadron left for West Malling, each departing Mosquito crew took it in turns to 'beat up' their old airfield, a display to remember by all accounts, 60 year old memories of which are recorded by 85 Squadron's Association to this day. John Lintott's faint signature is half way down the page on the right hand side. 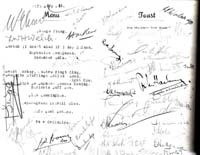 This image of Lintott's signature comes from a menu from the officer's mess at RAF Hunsdon, signed by the Squadron commissioned aircrew. This was signed in early May 1943 just before the Squadron left for West Malling. What is fascinating however is that the notation 'Ju88' is written after J.P.M. Lintott's signature in a different hand. It's only speculation but it is very likely that this is a reference to the Ju88 shot down by Lintott on April 24th 1943, a few nights before (his first victory) and one of his colleagues put it down as an 'honour' after his name. Any remaining doubts about the capability of the Mosquitoes were soon dispelled as 85 squadron dispatched its first Fw190's on the night of 15/16th May. Two aircraft from 1/SKG 10 sneaking in at low level across the channel were intercepted by Mosquitoes flown by Sqn Ldr Peter Green and Flt Lt Geoff Howitt. Howitt's crashed into the sea south of Hastings but Green's victim crashed near Dover the first of these single seat raiders to be brought down on English soil. If this wasn't impressive enough, Flg Officer Bernard Thwaites and his navigator Bill Clemo, chased a third Fw190 back across the channel shooting it into the sea and then despite damage caused by his disintegrating victim, also shot down a fourth aircraft. Flg Officer J.D. Shaw together with P/O A.C. Lowton shot down a fifth Fw190 before the end of the night by braving their own searchlight defences and dispatching their victim over Gravesend, returning to base covered in soot and with a badly damaged rudder; an emphatic demonstration of 85's prowess. 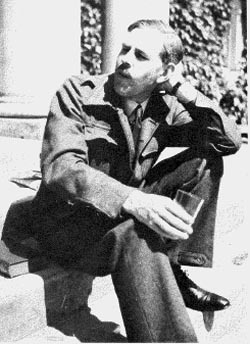 This photo taken on a sunny Spring day in 1943, shows a newly commissioned Pilot Officer George Greville Gilling-Lax DFC, enjoying a drink whilst sitting on the steps of 'The Manor House', which served as the RAF Officers Mess, a mile and a half from West Malling Airfield. Within weeks of this photo being taken, he would die alongside his pilot, Peter Lintott. Two nights later on the 18th, Peter Lintott and George Gilling-Lax enjoyed success against the Fw190's shooting down an aircraft of 2/SKG 10 over the coast, one of thirteen raiders dispatched from France that night. Patrolling over Dungeness, Lintott & Gilling-Lax were vectored onto an enemy contact from over 40 miles away. Despite clear conditions, the darkness of the sky required skilful guidance by Gilling-Lax using the AI radar. At 21,500 ft over the Thames Estuary, Lintott got a visual of a Fw190 fighter-bomber silhouetted against the lighter western horizon. He noted that the Fw190 carried long-range fuel tanks and a bomb under the fuselage. He lost sight of his quarry but closed and picked it up again, noting that the Luftwaffe pilot had just jettisoned his auxiliary fuel tanks. Lintott closed to 180 yds and opened fire from astern, causing flashes and sparks to fly off. The Fw190 made a turn to port and Lintott's second burst missed. His third however, resulted in further flashes and sparks through which the Mosquito flew. The Fw190 weaved erratically and disappeared below the nose of the Mosquito. Turning tightly, Lintott and Gilling-Lax saw an explosion beneath them as their victim hit the sea, a burning pool of oil and fuel visible for 20-30 seconds. The time was 23.30hrs. A week later Peter Lintott and George Gilling-Lax would score their third and penultimate 'kill'. KG66 (Kampfgeschwader - Bomber Group) was a specialist pathfinder unit established in April 1943 by Oberst Dietrich Peltz (the youngest commanding General in the entire Wehrmacht). He was personally tasked by Hitler into re-galvanising air operations against England. Woefully under-equipped, he stood little chance of success but 1/KG66 started to be re-equipped with the newest and fastest version of the ubiquitous Junkers 88 the 'S' variant which used nitrous oxide to boost engine performance. On the night of May 29th/30th 1943, Lintott & Gilling-Lax's took off from West Malling in Mosquito NFXII - HK119 coded VY-S. Patrolling above Lewes in Sussex they were vectored onto a 'bandit' seven miles away. Having established contact with a raider they closed in having repeatedly to climb eventually reaching 29,000 ft. The black night sky made identification difficult and Lintott thought that the enemy bomber was a Dornier 217 instead of one of the new Ju88S's. Having satisfactorily identified the enemy aircraft, Lintott opened fire damaging the aircraft by setting its starboard engine on fire. A second burst achieved the same result on the port engine, causing the crew to bail out. Two or three further bursts resulted in a lazy turn to port and the blazing bomber started to go down. The flames may have caused the raiders nitrous oxide tanks to explode as the aircraft blew up spectacularly. The photograph above shows Mosquito NFXII HK119 - VY-S, airborne from Hunsdon in early May 1943. This aircraft was used by Peter Lintott to shoot down the Ju88S on the night of 29/30th May 1943. The German aircraft was Junkers Ju88S-1 (140550) of I/KG66 coded 3Z+SZ which broke up in the air and crashed at Isfield, Sussex at 01.50hrs. The crew of Oberfw S. Simon, Oberlt A. Stanke and Fw P. Korte (injured) all bailed out and were taken prisoner. This aeroplane was the first of this new variant to be lost over England and the first loss for the newly formed KG66. This photo shows Oberlt. 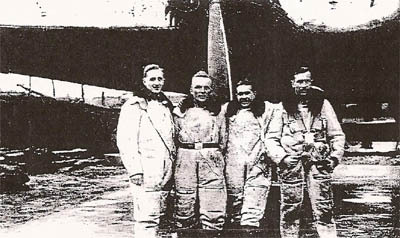 Alfred Stanke second from the left. Lintott and Gilling-Lax were by now seen as rising stars in 85 Squadron with three confirmed 'kills' with Peter Lintott earning the sobriquet 'killer' in recognition of his exploits. In early summer, the Squadron were enjoying considerable success against the German intruders, but in early July the weather broke. On the afternoon of July 9th, with driving rain and low scudding clouds, two experienced crews from 85 Squadron stood at readiness as an 'all-weather' section. 'B' Flight Commander was F/L Geoff Howitt and his radar operator F/O G N Irving were joined by F/L Lintott and P/O Gilling-Lax. They scrambled in the bad weather to intercept a wave of sneak raiders coming up the Medway under cover of the weather. Twenty minutes after taking off, the sounds of air combat could be heard from the airfield, above the cloud and rain, together with the sounds of anti-aircraft fire. The unmistakable sound of cannon fire from a Mosquito was heard together with the rising scream of a descending aircraft cut short by the sound of an ominous 'thump'. Neither aircraft returned to West Malling and the frustration and concern on the airfield was considerable. After a short while the RAF base at Detling just across the Medway Valley reported that a Dornier 217 had crashed close to the airfield. Local anti-aircraft batteries were claiming the kill but it emerged that the local GCI (Ground controller) at Wartling (Controller, Flying Officer Norman), had guided Lintott onto this aircraft and he had been tracking and closing on it for seven minutes before it crashed. The controller had followed both blips on his screen but both had disappeared at the same time at 17.27pm. A phone call from RAF Bradwell Bay on the other side of the Thames Estuary brought confirmation that Howitt and Irving had landed safely, flying in under the low cloud having pursued the raiders out to sea. Then finally the news that everyone had been dreading. Lintott's Mosquito was found less than two miles from the wreckage of the Dornier at Boxley near Maidstone, with both crew dead in the cockpit. Later examination of the Dornier revealed that it was riddled with 20mm cannon rounds and the anti-aircraft gunners sensibly withdrew their claim. 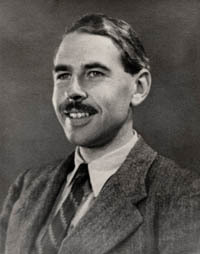 The Armamant Officer from Fighter Command HQ later inspected the wreckage of the Mosquito and determined that Lintott had indeed fired his guns. 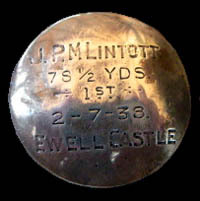 Lintott and Gilling-Lax were credited with their fourth and final victory (one short of acedom) before they crashed into the ground. The inspection of the Mosquito revealed that it had partially broken up before it hit the ground. 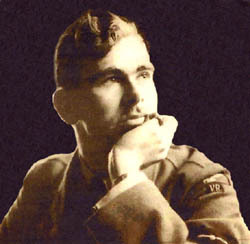 There is the possibility that in his determination to shoot down the Dornier, Lintott may have collided with the Dornier. Alternatively, it is also possible that the Mosquito could have been damaged by debris from the disintegrating bomber. It does seem however, that an error of judgement in appalling weather conditions and at very low level, combined with the distraction of an eagerness to shoot down the intruder, cost Lintott and Gilling-Lax their lives. 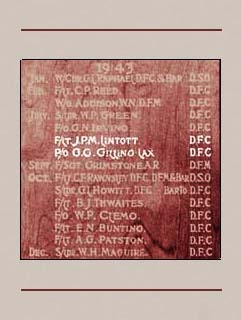 They were a bitter loss to the squadron; Gilling-Lax had only recently been commissioned, just in time for both himself and his Pilot, John Lintott, to be recommended for the Distinguished Flying Cross the week before. Lintott's and Gilling-Lax's victim was Dornier 217K-1 (4519) (U5+FP) of 6th Staffel KG2 which crashed at Bicknor Court Farm, Detling, Kent at 5.27pm. The aircraft disintegrated upon impact and the crew were all killed; they were Oberlt H. Zink, Uffz W. Bernhardt, Uffz E. Freiermuth and Obergftr E. Stiermann. This Dornier 217 was one of ten aircraft dispatched by KG2 on July 9th in appallingly bad weather and one of these raiders was eventually responsible the bombing of the Whitehall Cinema in East Grinstead. This was a tragic incident caused by a bomber circling the town before dropping a stick of eight bombs across the Town Centre. It is still unclear what the target was; a convoy of trucks in the High Street or perhaps a train that had pulled into the station. The cost was terrible for so small a town, no fewer than 108 people were killed and 235 injured, requiring a communal burial of some of the victims on the following Wednesday. It is always perhaps comforting to think that the perpetrators of such an infamous attack failed to escape and many Banstead villagers believe that this raider was the one shot down by Lintott, but whilst there is a very slim chance that this is so, it seems unlikely. The aircraft had been pursued by Lintott for seven minutes as it looked for targets of opportunity over the Medway area of Kent, it was brought down at Detling in KENT. East Grinstead in SUSSEX is about 30 miles (as the crow flies) South West of Detling, which means that had it dropped it's bombs on East Grinstead it would have been flying North Eastwards (away from it's French base) when Lintott shot it down. East Grinstead Dornier or not, Lintott & Gilling-Lax's achievements were considerable and were recognised with the award to both men of the DFC, gazetted some two weeks after their deaths. Volunteer Reserve, No. 85 Squadron (since deceased).
' a brilliant crew and a severe loss to the Squadron'. 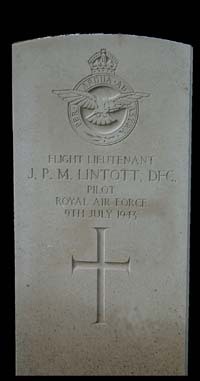 Flight Lieutenant J.P.M Lintott D.F.C.,a member of a famous night squadron in Fighter Command to whom the award of D.F.C. was announced on July 27, was killed when his aircraft crashed after he helped to shoot down a German raider. The enemy aircraft - a Dornier 217 which was also fired on by anti aircraft guns - was the fourth raider he had brought down this year. Lintott who was 22 and whose home was in Surrey, got all his four victims within 12 weeks this year. His Flight Commander has said of him : "He was an extremely popular member of the squadron; both he and his observer will be greatly missed." 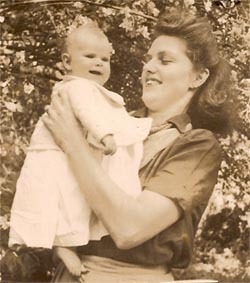 Following Peter's death, Mrs Shirley Lintott discovered that she was expecting their first child and early in 1944, she gave birth to a baby girl. Mrs Lintott called her daughter, Jenifer Peta Marley Lintott in honour of her late father and she has always been called Peta. Mrs Lintott remarried a Captain Tollington some years later and lived in Germany and later Cyprus. Peta was eventually adopted by Captain Tollington who of course became "daddy". 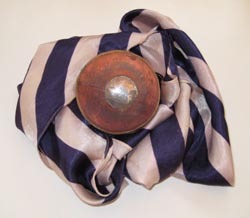 Peta always referred to Peter Lintott as "daddy Peter", and although she clearly never knew him she has kept several treasured possessions of his, including his photograph albums, his cameras, his cricket ball, his DFC, and perhaps her most treasured possession, his blue and white striped silk scarf which matches the DFC ribbon, and which she wears every Remembrance day. 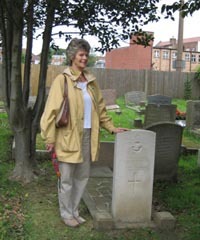 One of Peta' chief regrets is that she never knew about the service held at Banstead churchyard in 2003 when on the 60th anniversary of Peter's death, a new Commonwealth War Graves Commission headstone was erected at Peter's family grave, where he is buried with his father. It also transpires that the family were not aware that Peter is remembered on the Banstead War Memorial and once Peta was made aware of this, she came up to Banstead within a few days. Peta met with Lewis Wood and Mark Stanley of the Banstead History Research Group and visited the memorial and also the grave which is located just to the West of the main door to the church. Peta also brought with her all the items mentioned above as well as newspaper cuttings from the time and a fragment of her father's plane. There is just too much to include on this website and it is Mark's intention to write Peter Lintott's biography at some time in the future. Peta reading a peom by Percy Wichelo, written in remembrance of her father Peter Lintott DFC. 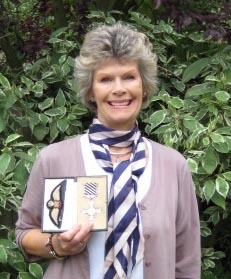 Peta holding her father's DFC and wearing his Pilot's scarf. Grave Reference: West of Church.
" 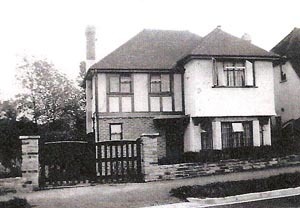 It was about 1947 when we moved into no.157 Widmore Road Bromley. A few doors down on the opposite side of the road were the two houses that were damaged by the plane that crashed there. I never knew whether it was a British or a German plane, but it had sliced off the back of the two houses which were subsequently demolished. They were a pair of semi detached properties each with a basement, ground floor, first floor and an attic and I remember the steps leading up to the main door. The houses were eventually replaced by flats. At the time we moved into 157, the property had been empty for a while and the garden was completely overgrown. I was a young girl then of course, but I remember clearly being told not to play at the bottom of our garden as some of the debris from the plane had also fallen there. We had to be careful as there were several small bits of metal as well as two large 'tanks'. I don't really know what they were. In the house was a large mantlepiece, and one day when I was with my mother and grandmother we saw a man leaning against it. He was an officer in uniform, fair haired and cleanshaven and he stood there and said nothing. I don't know if he was British or German. We saw him several times over a period of about six weeks. Each time, he stood in the same place and never said a word. Eventually my grandmother got fed up with him and told him to go away. We never saw him again." That is strange enough but what Mrs Edwards did not know was that Lintott shot down this plane at 0025hrs on the 25th of April 1943. That day was Easter Sunday. Fighter Squadons of the RAF & their aircraft - John Rawlings 1969. Poem by Percy Whichelo read by Peta Watson. Personal photos loaned to BHRG by Mrs P Watson. Family History by Christine Kent and Barbara Rough. Peter was the son of Richard J P Locatelli, a provision merchant and importer, and Edith M Locatelli. 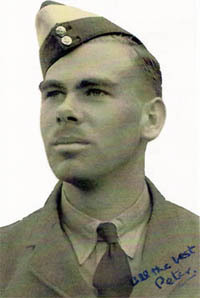 According to his medal record, Peter was born on the 26th May 1923 in Coulsdon. The following notice was printed in the Banstead. Surrey Mirror on the 10th October 1941. The death is also announced of Peter Cyril Francis Locatelli (Cadet), of the Merchant Navy, whose home is in Garretts-Lane. (Peter lived at Leewood 24 Garratts Lane.). Four closed records in the 1939 register suggest four children. Electoral registers suggest they may have lived near Guildford before the war, came to Banstead in 1938/39 and had moved to Mulgrave Road, Sutton, by 1945 and then on elsewhere. The SS ALMEDA STAR a 14,935 ton Blue Star Line passenger liner (Captain H.C. Howard) was sunk by the U-96 (Kptlt. Heinrich Lehmann-Willenbrock) while en route from Liverpool to the River Platte. The attack occurred about 250 miles west of the Island of Lewis in the Outer Hebrides, Scotland. There were no survivors. A total of 166 crew and 194 passengers lost their lives. The U-96 was later bombed and sunk by US aircraft at Wilhelmshaven. George Duncan's Historical facts of WWII. Additional Tower Hill photographs by Mike Shackel of BHRG. The family were cheese importers based in the City. There is a phone number from 1901 in Holborn. The 1939 phone book has a big advert across the top of the page for Mattia Locatelli cheeses. There were 2 interesting sealed records in the National Archives which look as though some Locatellis worked for Special Operations Executive during WW2 but Peter isn't one of them. The only relevant birth record is very vague. Sept Q 1923 Locatelli (Male) mother Norton Wight registered in Croydon. This is probably Peter but if the medal records are correct it was registered late and why no name? This is usually when a child has subsequently died only a couple of days old. The marriage record is March Q 1915 Ricardo GMF Socatelli (sic) married Edith Norton Wight registered in Lambeth His birth is registered as Richard John MF Locatelli in Fulham in 1888. So the marriage entry is definitley a typo. In the phone books I lose him in 1927, nearest he gets is Dulwich then Sydenham. Edith seems to reappear in Orpington in 1961. So Coulsdon is the nearest address to Banstead that we have. Tried twice to Contact Locatellis but no response. 9 Nov 2011 Tried to make contact via Chris Evans who knows Giorgio Locatelli. 14 March 2019 James Crouch identified Banstead link and address via Banstead Surrey Mirror and 1939 register.